Sometimes it’s the feel of a custom-fit golf grip. Other times it’s the amber glow of aged bourbon. Sometimes it’s the rich aroma of a leather hunt seat. And other times it’s the sweet woodsong of a hand-crafted violin. Whatever the case, you know distinction when it’s in your hand. 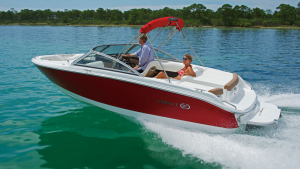 Cobalt boats embody that distinction. Stokley’s Marine is proud to be a part of that heritage—and honored to be your Cobalt dealer. The hand-stitched helm wrap. The built-for-a-lifetime, Kevlar-lined keel. The generous use of stainless steel over plastic. 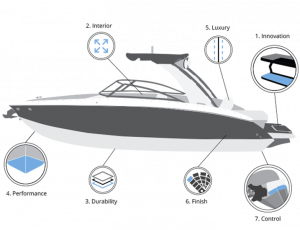 Everything about a Cobalt boat sets it off as “the best of the best.” Attention to detail, craftsmanship, and uncompromised standards of excellence establish Cobalt boats within yacht-class luxury. Because we live and work in the Bluegrass region of Central Kentucky, we understand the value of legacy. With the charming elegance of southern hospitality and the speed of a thoroughbred, a Cobalt is at home here. Having served boaters in the greater Lexington area for nearly fifty years, Stokley’s Marine prides itself on family tradition and a commitment to uncompromising excellence. And that’s just like the family of folks in Neodesha, Kansas, who have been building Cobalt boats for five decades. We offer Mercury Mercruiser award-winning service, a complete line of accessories to complement your boating experience, and a team of professionals more interested in building a relationship with you than in turning a quick sale. All of this says just one thing: We want to be your Cobalt dealer for life. The Gateway Series is the ideal place to meet Cobalt. With models ranging from 20 to 23 feet, it is entirely possible to join the tradition at a price point below $50,000—and without compromising quality. Maybe you’re a first-time boater–eager to get started but a little nervous about trailering on the scenic but winding roads leading to Lake Herrington. Or maybe you boat locally at Taylorsville Lake and really want to keep your Cobalt inside your garage. Or just maybe you prefer a smaller boating platform but still appreciate the unsurpassed ride and amenities of a Cobalt. Whatever the case, the Gateway Series is ready for you. The R Series ups the ante by building in features and amenities well-suited for models ranging from 23 to 34 feet. Deeper interiors, a broader array of custom options and upgrades, and extended lengths make these boats ideal for bigger groups and bigger water. As a result, the mid-size R Series excels on Laurel Lake, Cave Run, Green River Lake, and Lake Cumberland. 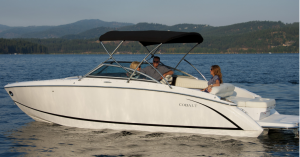 The A Series by Cobalt represents the apex of Cobalt boats. Stainless-steel anchor windlasses. Sculpted hull sides. Hydraulic swim steps at the transom. And with extended centerlines, an unparalleled ride whether you’re lounging on the Ohio River for Thunder over Louisville or dropping anchor in a Lake Cumberland cove. The SC Series brings together the efficiency, performance, and convenience of a Mercury outboard engine with the luxury, comfort, and style of a mid-size runabout. In transitional climates like Kentucky, an additional advantage of an SC Series Cobalt is the elimination of the need for winterization—outboard engines are ready for use year-round. So when the warm days of summer linger late into the fall, your Cobalt will be ready to take you on tour of nature’s autumn colors. If your appetite is a bit sportier, consider the WSS Water Sports Series. Wake towers with bimini tops. Billeted wakeboard racks. Directional speakers. Custom exterior graphics. The WSS Series promises heart-pounding action in a package certain to satisfy the most discriminating boater. The R3, R5, and R7 models are all available in the WSS Water Sports series. Or perhaps your passion is wake-surfing. The SURF Series offers touch-of-a-button surf control with ballast tanks, total trim control, on-plane running with full ballast, and the Volvo Penta ForwardDrive outdrive.